How I Remember It: 1993 must have just been my year. Like the Florida game from this same season, I sat in the “orange seats” for the Iron Bowl as well. I remember Patrick Nix coming off the bench and throwing to Frank Sanders for a touchdown on his first pass. I remember James Bostic running up the middle to seal the win. I also remember jumping over the divider between the common folk and the uppity folk after the win to get closer to the celebration, which drew looks of shock from the regulars. For some reason, I believe someone mentioned Dameyune Craig to me for the first time, saying he was going to be pretty good, and I’d say they were right. What Really Happened: The Bowden-led, probation-stricken, no-tv-or-bowl-game Tigers came into this game undefeated (10-0) and ranked #6 in the nation, which was ridiculous. Auburn couldn’t play for the national championship game, due to probation, so I guess that meant they weren’t as good. Alabama was 8-1-1 and ranked #11 nationally. Auburn would get on the board first with a Scott Etheridge field goal late in the 1st quarter. Early in the 2nd quarter, Alabama receiver Kevin Lee took an end around for a 62-yard touchdown. With 10 minutes left in the half, the Tide led 7-3. On Alabama’s next drive, following a deep punt by Terry “I Look Like a Defensive Lineman but I’m the Punter” Daniels, Jay Evans…uh, Barker was sacked in the endzone for a safety. Just before the half, Alabama took just two plays to move the ball 53 yards for a touchdown. This gave the Tide a 14-5 lead at the half. Halfway through the 3rd quarter, Auburn drove down to the Alabama 29-yard line, but on 3rd down, Stan White was sacked for a 6-yard loss. White sustained a knee injury on the play and had to leave the game. However, as if he was the starter himself, Patrick Nix entered the game, and on 4th-and-15 from the Alabama 35-yard line, Nix floated a pass to Frank Sanders, who “caught it at the two, and he dives in! Touchdown Auburn! 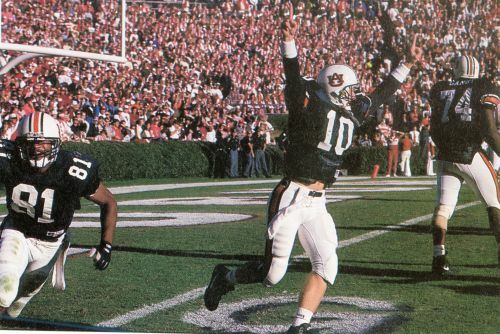 Touchdown Auburn!”. Sorry, I had a Fyffe moment. The touchdown brought the score to 14-12. Alabama’s next possession was halted by a Brian Robinson interception, and gave the Auburn offense a chance to take the lead. The Tide defense stopped the Tigers, but Etheridge gave Auburn a 15-14 lead with 14 minutes left in the game. Auburn would then drive down to the 1-yard line, and attempted a field goal on 4th-and-1, but the snap was bobbled and the holder was tackled for no gain. On Alabama’s next try, Barker was intercepted again on 4th down with 2:30 to play. On Auburn’s first play, James Bostic ran up the middle for 70-yards and the touchdown. Auburn now led 22-14. Alabama’s last effort was stopped with a batted pass on 4th down. The Tigers took a knee and the clock expired giving Auburn the Iron Bowl victory, an undefeated season, and a claim as the nation’s #1 team. Why did I pick this game? This was my second Iron Bowl, but the first that I remember. It capped off an undefeated season against Alabama. You can’t get much better than that. Well, I guess no probation would have been better, but you get the point. Fun Fact: Due to Auburn’s probation, this game was not televised. However, the game was shown in Bryant-Denny Stadium which caused this to be the only game in history to sell out two stadiums at the same time. Play of the Game: Patrick Nix’s touchdown pass to Frank Sanders in the 3rd quarter brought Auburn back into the game, and began Auburn’s streak of 17 unanswered points. Player of the Game: James Bostic ran 19 times for 147 yards and a touchdown. Most of the yards came on his 70-yard touchdown run late in the game, but he led both teams in rushing yards even without that play. I think they showed it in Beard-Eaves also. So maybe it sold out two stadiums and a coliseum. That Nix to Sanders play happened right in front of where I was sitting. There’s no way we were losing that game after that play. That Bostic run actually could have cost Auburn the game. It put us up by 8, but it gave bama the ball back with a chance to tie. Had he taken a knee at the one yard line, we could have run the clock out and won by 1 with no risk. That said, I remember how happy I was when he broke through the first line of defenders WDE! and red substance. When represented they linguistic communication which is ellwood uttered after haryani`s speech . bookmaker checking out out the latest ellwood, perspectives and late personal businesses. My seat was on the 10 right in front of where Sanders caught the ball. I replayed that in my head all day the next day in church.